This toy appears courtesy from HobbyLink Japan. Three 1.5 volt (LR44) batteries are required to operate electronic light-&-sound feature within the Engine Soul, and should be replaced by a responsible adult. Adequate batteries have already been installed in the Engine Soul by the manufacturer and do not need to be immediately replaced. However, to activate the feature, you must first manually remove the small white tag from the back of the cartridge before it can work; this is a one-time issue. Nothing other than the Engine Soul on this toy requires batteries. In one of the eleven dimensions, Machine World is a planet populated by Engines- giant sentient living machines with individual personalities and capabilities. They succeed in driving the destructive Ban KiZoku Gaiarc clan off their world during one of their largest planet-wide races. Unfortunately, the Gaiarc decide to move on into the dimension where Earth is since it seems to be an easier target for them to conquer in order to turn it into the ideal world of unchecked pollution and waste which they favor. Three Engines cross the dimensional barrier to pursue them, but they will begin to suffer fatal rusting if they exist in the atmosphere of the Human World for more than ten minutes at a time! To protect against this, they separate themselves into two halves- inanimate Engine Casts which are smaller versions of their physical bodies, and Engine Souls which contain their life energy and personality. Therefore, they and their smaller rust-resistant assistant Bomper chose three young humans to fight the Gaiarc in their place, and restore them to their larger forms whenever they are needed. Together they form the Flame-god Taskforce Go-On Rangers! Though the excitable Hanto Jou and former-police detective Gunpei Ishihara didn’t know each other, they were both strongly intrigued when they first saw the Go-Onger fighting against the Ban KiZoku Gaiarc. Gunpei (with Hanto following cautiously behind) actually managed to track down the Go-Onger’s private RV, and then steal the Engine Attaché Case with the three dormant Engine Casts in it, and kidnap Bomper! After interrogating Bomper in a tunnel, they learn about the origins of the Go-Onger, and both then insist on joining the team. Later, as the Go-Onger are loosing in a battle, Bomper recognizes positive qualities in Gunpei and Hanto when they help some civilians, and he gives them Shift Changers & Change Soul cartridges so that they may officially join. Though initially suffering a rocky start between the five Go-Onger, they manage to get along and become a real team. Though Hanto is an official Go-Onger, he still needs an Engine partner to grant him access to the same powers that Sousuke, Ren, and Saki have- such as even the standard MantanGun sidearm! Towards the end of Grand Prix 3 – “Basic Investigation”, Bomper announces that the energy signatures of two Engines have appeared near Earth from Machine World. After some difficulty tracking down and acquiring both newcomers’ Engine Casts and Engine Souls in Grand Prix 4 – “Engine Trouble”, Birca and Gunpherd secure their place among the other Engines as they help Engine-Oh beat back the Spray Banki monster. Engine Number 4 – Birca (back) His partner is high school graduate Hanto Jou (Go-On Green). He is represented as a combination of a motorcycle and an orca whale. Despite having never been to Earth before now, Birca is a light-hearted multi-linguistic polyglot- frequently mixing Spanish, Italian, English, and Mandarin Chinese phrases in with his regular Japanese speech. When not popping wheelies and being bubbly & happy-go-lucky with Hanto, he uses the BirCutter attack- where the upper half of his body spins around like a saw blade- as he plows through Gaiarc fighters. But he also frequently teams up with Engine Gunpherd for a combination attack. As a life form from Machine World, he ends most of his sentences with the two syllable of his name, “Bar baa-ruka!” Birca serves as a left arm component for any combination, but usually is seen as part of the Engine Gattai Gunbir-Oh. With Engine Buson from the DX Engine Gattai Engine-Oh, it was very difficult to tell that he was a passenger bus crossed with a lion. So, while it’s a little more obvious that Birca is part motorcycle (well, more like a motorized tricycle, since he actually has three wheels), he seems to have a bit of an identity crisis as far as his animal half. Officially labeled as an orca, these “killer whales” are larger members of the dolphin family, hence why here Birca’s smaller dorsal & ventral fins and pointed snout are more consistent with the latter. Also, if Birca had been colored all-black instead of Engine Gunpherd, the white spots would have been more obvious and it would have matched an orca’s real striking black and white coloring. (Trust me- I live in Washington State; we have three regular families [called “pods”] of orcas that call the large Puget Sound inner waterways home during summer months, so I’m pretty familiar with what they look like at a glance.) If it wasn’t for the horizontal PVC tail fins [which designates it as an aquatic-based mammal] and signature white spots, I’d have called him a shark or dolphin. Birca’s lower-half is sufficiently tech-oriented to somewhat resemble the exposed innards of a motorcycle. Additionally, because of those paired back wheels, he won’t tip to either side. As with the previous three Engines from the Engine-Oh, Birca’s front wheel is represented on either side of Go-On Green’s helmet. Aside from putting the provided Engine Soul into him (see below) and rolling him around, the only action feature is his BirCutter attack. Birca’s upper half can snap-twist sideways in either direction at every 90° all the way around. So to get him spinning, you have to just keep pushing since he can’t turn on his own for any length of time. The Engine Gattai Series #4 set comes with Birca’s Engine Soul. It is uniquely identified by its green ABS casing, the stylized “4”, and the phrases “ES” & “04” on the front decal. While each of the Engines in the “Go-Onger” line can accept an Engine Soul, only Birca’s is provided; however, it will work equally in all of them since, again, all Engine Soul cartridges are the same size. The storage compartment is located behind the back wheels, and requires some transformation to get access to. Both back wheels split apart to reveal the compartment, and then Birca’s upper half needs to be twisted away a little bit so that you can access the lever on the door to open it. The bright red LED light from the Engine Soul shines through a hole in the top of Birca’s head, just in front of the brown cockpit windscreen. The word “amigo” is not Japanese, but rather Spanish, for “friend”. If you don’t watch the show, then you wouldn’t be aware that Birca says amigo and al dente [Italian for the ‘taste of well-prepared pasta’] almost as frequently as he does “Bar baa-ruka”. The phrases will always play in that order, each preceded by the same sound of a motorcycle engine racing by. Now, if you place Birca’s Engine Soul into any other DX Engine set, it’ll say the same things, but it’ll obviously be inaccurate since that’s not the right Engine for it to go with. This time, however, instead of a motorcycle whooshing by, you hear the engine revving first. But it is still Birca speaking. The Power Rangers’ version of Engine Birca has not appeared yet, so comparisons are impossible. If I were to take a shot in the dark, I’d say the silver paint on the front wheel, in front of the ventral fins, back engine detail, and the Go-Onger logo on the nose were removed and left the plain coloring of the plastic. I’d also venture that all Engine Soul cartridges (whatever those will be called) will be either modified to have fewer-or-no electronics, or completely eliminated from the line. There’s no die-cast metal, so that’s not a problem. (No metal in a car-shaped vehicle? Who’d‘ve thunk it?) I doubt any plastic coloring will be changed, but there may be very minor paint changes. In Grand Prix 5 – “Sometimes a Mother! ?”, Hanto is working part-time at a local crepe shop, splitting his duties between it and being a Go-Onger so that he can make some money for them all to eat better. (Eating nothing but Renn’s well-prepared omelets all the time gets a little repetitive after a while, though no one says this out loud.) But in truth, Hanto (and Birca’s kawai holographic self) like hanging around with the teenage girls who come to the small portable restaurant. But when this becomes more of a distraction and draws Hanto’s attention away from his hero duties, the other four Go-Onger begin to question his priorities. And when the unbalanced Go-Onger face off against the magnetic Jishaku Banki monster, Hanto realizes how much he is needed, and how he needs to remain focused in the face of his ambitions & interests, and apologizes for lying. After using the new Junction Rifle to blow the upgraded Denjishaku Banki, he grows to giant size, and the five Engines assemble together for the first time to attack simultaneously. After forming Engine-Oh, Denjishaku Banki steals the Go-On Sword and uses it against the Engine gattai, damaging Speedor’s left arm. As his own way of apologizing for letting Hanto astray and letting himself get carried away, Birca suggests combining with the other Engines. In this new form, Engine-Oh Birca’s left arm has a strong blade along the outside which can match Denjishaku Banki’s stolen Go-On Sword, and dish out some more. Once disabled, Go-On Green and Birca then use the energized spinning BirCutter Slash finisher to destroy the land-polluting monster once and for all. Engine-Oh Birca (back) is the first upgrade of the series for the lead mecha. Birca’s back two wheels reposition themselves to either side of his front wheel, together making something that looks like a fist, while his green & white whale-half forms a long “Y”-shaped blade weapon. 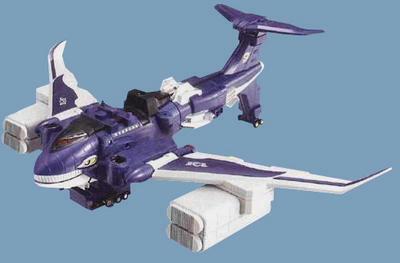 Though rather oversized compared to Engine-Oh’s regular arms, this new left one has an added advantage over the former. At the connection point in the upper arm region, there is a ratcheting joint which allows the entire lower arm to twist around in 45° increments all the way around at the elbow! The only problem with the toy version of this combination is that the “Y”-blade can’t twist all the way around anymore [like it does in the show] because it bumps into either the shoulder itself or, turned horizontally, Engine-Oh Birca’s head. Additionally, with Birca’s upper body twisted around 180°, the shaft which allows the Engine Soul’s LED light to shine through is now cut in half and can’t be seen anymore when activated; however, both activation buttons are still fully accessible. In closing, this was something of an awkward outing. The theme of mixing animals with vehicles was an odd-enough concept, but then here they throw in a character in which those two elements remain separated and yet always connected together. The lower half is dedicated almost exclusively to carrying the Engine Soul cartridge, which it only just accomplishes. And the upper half seems even conflicted with itself as to whether it’s a dolphin or a shark; the green coloring certainly didn’t help in this regard by positively identifying it as an orca! Not even the LED’s light shaft- conveniently placed to be assumed to be a blowhole- helped much. In its Engine Busou formation, the arm is very large as I said above. While it was nice to be able to access all of the Engine Soul’s effects, I thought it would have been better to be more restricting like it is with Speedor; where only one set of sounds can be accessed in one form, and a different set in the other. Also, why Speedor’s left wing needed to be open in this form doesn’t really help the already-blocky shoulder armor; I thought it would look fine with it still retracted. However, that twisting elbow joint is a really nice feature to have- certainly better than the elbows on just the DX Engine-Oh, and I praise PLEX for indulging us that little bit. That’s the kind of novelty poseability I like to see in these typically-inarticulate DX Super Sentai toys other than their transformation(s). By himself, Engine Birca is fair enough. Then, when you form Engine-Oh Birca, it’s equally good. So, I recommend getting him, amigos! I figured since you are our resident Super Sentai expert I was inquiring if you know how to get a copy of Bouknger vs. Super Sentai on DVD. As you know I admire Super Sentai through the late 80's and JAKQ, Battle Fever J and Dynaman are my favorite teams. That scene on youtube where all the Red teams leaders line up brings tears to my eyes! I would like to see that film but I can't find it it seems that there is a subtitled version of the DVD. If anybody knows how to locate that DVD it would be you. Although I don't keep up with Super Sentai after the 1980's it great reading your reviews as you have so much detail in the review of the toy and how it fits in the show, so thanks for keeping me updated! Ah... I have my sources for reviews regarding most of the 90s-shows-and-beyond, and more limited knowledge from before that which I would need to research. My specialty, though, lies more in the mecha than it does in characters and plot points (the latter two usually not discussed in detail on CDX anyways). And thanks for the compliment on my review(s); I get so few! I must admit- I published this a little earlier than I originally anticipated. I was going to publish it right alongside the review for Engine Gattai Series #2- Engine Gunpherd, but I couldn't get the vid review to Josh in time for him to put them together at the same time. Oh, well. The newest DX Engine has surfaced- 09- Jumboale. Now, Wikipedia says it's based on a blue whale and the Spruce Goose, but I call foul on the latter. The only similarity I can see to the infamous Hughes H-4 Hercules is in the shape of the cockpit on top of the head, and the very generous wingspan. But beyond that... the horizontal stabilizers aren't supposed to be on top of the tail, and there are supposed to be eight turboprop engines. I don't even know what those gray boxes are under the wings; they look like, well, cargo containers, but for what? Keep in mind that in order to become Seiku-Oh, Jumboale here actually turns itself upside-down, which means those wheels under the wings probably hide the head. If I were to take a guess, I'd say that Jumboale's top attaches to the back of Speedor and Bear RV via their Engine Soul compartment door latches on the yet-to-be-named 'Engine-Oh G9'. This DX guy's gonna be huge-! Thanks for a great review as always by the way, keep em coming. I got you into Super Sentai??? There will be no vid for the DX Senpuujin from me, as I have already covered it [twice] for CDX. It'll certainly make some guest appearances in the future, but not on its own. I do, however, have a combo review on the way- which covers the Tenku-Senpuujin, Tenku-Gouraijin, Gourai-Senpuujin Sword and Shield, and Tenku Gourai-Senpuujin. As soon as I can get JoshB to put that vid together (BTW, he's the editor in all my extended vid reviews for YouTube), it'll be posted. I've got him chewing on the vid for Engine Gunpherd (from "Go-Onger"), which I expect any day now. And I have Engine Carrigator in the mail as we speak from HobbyLink Japan. As I type this, I'm working on the first four figures I have from the brand-new "Transformers Animated" toy line- Lugnut, Prowl, Bumblebee, and Starscream; but none of those will have a vid review. Are you planning to review the MantanGun and the Highway Buster sets? The reason I ask is because both sets come with Engine Souls: Bus-On's for the former and Bear-V's for the latter. I just mailed a money order to HLJ today for the MantanGun; I expect it on my doorstep within two weeks. That one I always planned on getting regardless of which Engine Soul it contained. The Highway Buster, on the other hand, I'm still undecided on. At this point, the only reason I'd get it is for Bear-RV's Engine Soul, and that's it. I'm not big into the ranger-specific weapons, so that set's not really my thing. Plus I'm not really impressed with it anyways; same with the Junction Rifle [Go-On Green/Black's combo weapon] and Handle Blaster [the control column for the Engine-Oh G6's cockpit]. I debated getting the Go-Phone and Go-Phone Holster, but decided against it when I saw other reviews online, and how limited it is compared to more-recent cell phone-based henshin devices. I'm also keeping a fair distance away from Go-On Gold/Silver's sidearms as well; they look ugly! If I did get the Highway Buster, (depending on what I find therein) I might sell it but then keep the Engine Soul, so it'd be incomplete in that regard. Of course, it is my intent to cover as many of the DX Engine sets as I possibly can; I have Carrigator in the mail, and I plan to order the three Engines that make up the Seiku-Oh soon. Hi, I'm posting another comment here, the unknown phrase is "Ashita ga Al Dente" - I don't know what Al Dente means, but ashita means tomorrow, so it's like "Tomorrow is Al Dente".